First of all, what was the reason that made you decide to continue competing after you had won a silver medal at the World Championships and a bronze medal at the Olympic Games? "There have always been so many people around me who have supported me and my skating. I even had a meeting with the Kazakhstan president after the Olympics in Sochi and he wished me the best for the Olympics in South Korea, so as you can see there was no reason for me to stop. I think I have a huge support from the people of my country; I am also a member of the presidential sport club of Astana and I have recently signed a contract with Yu Na Kim's management company. My parents, needless to say, were the first ones to support me. They don't mind whether I skate or I don't, but they're always there for me – as well as my coach. Also, looking back there have been many kids in my country who have been inspired by me, they want to be good skaters and I understand that I just have to continue because of all of these people who do believe in me. This is where I get my power, my inspiration. Hopefully I will meet all the expectations that are upon my shoulders". Are you going to take it year by year or do you plan to skate until the next Olympic Games? "I'll definitely try to think about making it until the 2018 Olympics. I have a vision of what I should work on and in which areas I should be improving, in order to be where I want to be at that point. But in sport and in life you never know what might happen tomorrow, so I'll try to live my life at its best everyday. 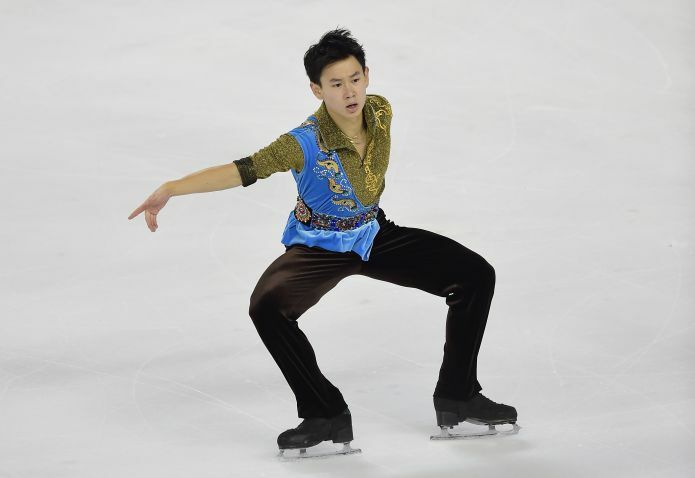 Hopefully everything will go according to the plan and I will be able to skate in Pyeongchan". I guess you are referring to the injuries and health problems you have had in the past seasons. How is the situation now? "I think that injuries are part of the athlete's life, and now I am dealing with them. There's no tragedy about it, I have never been 100% ready or to the best of my physical condition, I am just trying to accept all the obstacles I meet in my life, and to go through them. This season, I am grateful that my health is way better than last year. The past season for me almost looked like a reality show project, it was really strange and ridiculous! I kept getting injured over and over again. My ankle injury is better now, I can do the triple Lutz this year - which I couldn't do perfectly last season because of my injuries. I also changed my boots and the ones I have now fit very well – last year I had problems with those too. I am happy about this. I try to be grateful for all the good things I get this year and I'll try to make the best out of them". How are you able to regroup every time you face an obstacle? "I call 911 (laughs). Well, I am not the only one who struggles here, I am sure there are other skaters who have their own problems as well. It's hard to say how I managed to regroup, perhaps it's my eastern mentality; I am so used to deal with things by myself and I know how to do it. In Korean and Kazakhstan's cultures you take the life as it comes, you accept it. Life is not going to give you only nice things, there are of course going to be happy moments, but if you had only nice happenings then you'd never fully enjoy all of them. Moreover, there are people – my parents, my coach – who always stand by me and I know that I can always share with them my thoughts whenever I need to. After all, there are going to be many things in my life I'll have to deal with. Now that I have some sort of experience, what I do is following my instinct whenever there's a problem". Talking about your programs, for the Short you chose Caruso, an extremely famous Italian song, while for the Long you chose a folk song which is closer to your culture. I was wondering why you picked such different music genres, as the latter is very close to your culture while the first is very distant. "About the Short Program, I have always been a huge fan of Italian music and in exhibitions I have skated several times to Italian songs – Cinema Paradiso, Per Te, Mi Mancherai – all of them performed by Josh Groban. When I was with Lori Nichol in Canada I was improvising to several pieces of music, in order to find something interesting for my new programs. We knew that this season I could use lyrics and I was looking for something new that could make me feel different on the ice. Lori mentioned this song by Lucio Dalla, and while I was skating through it she said that I somehow changed, and that it made me look special. I think I was lead to this program, I was learning from each exhibition a lot and when I listened to that song I thought I was ready to skate to such a huge and serious piece, that I was mature enough. That's how we chose Caruso. Concerning the Long Program, I had actually never heard that music before. It is a huge mix of different styles and directions of music. It was performed by the Silk Road Ensemble, directed by Yo Yo Ma, the famous cello player. By funny coincidence, I was born in a city near the Silk Road, so I thought it would have been interesting to take such a particular piece for my program. Moreover, I deeply enjoy skating to it. It's a little bit like one of my former programs - The Artist - which had different music styles in it. I just have to learn how to mix technical and artistic sides in this program, hopefully by the end of the season the program will evolve and get better and better with every additional performance in competitions".